The 40k TT (Time Trial), Abergavenny and The Tumble. As you are all now aware the route has increased to 140km (read about it in the last blog) which has made the Velothon Wales a little more challenging. We had however already planned a couple of training rides including a 40k Time Trial (TT) and a trip to Abergavenny and The Tumble. Gareth (our route master) had set a route for the 40k TT and we were all to meet up at Pettigrew Tea Rooms and ride the route as fast as possible. There was a time limit of 2 hours for this ride as we were riding a third of the distance and 2 hours was a third of the time (still 120k). We also had to take our own tools and equipment with us in case of any mishaps and so no other team member had to stop to help with punctures etc. For this 40k TT there were 4 of the team present Andy, Gareth, Paul and myself (Mike). The route was going to take us over Caerphilly Mountain via Tongwynlais, through Caerphilly, Rudry, round Pontprennau, through Lisvane and to the finish in Llanishen. Quite a challenging route with a fair bit of climbing and descending. Andy set off first as he had decided that he was going to be the slowest of the 4 followed by Gareth, Paul and myself. The weather was not too bad, it wasn’t too cold, it was dry but it was quite windy. The ride went well for the team unfortunately we didn’t all take the same route as with tiredness setting in we lost our way a little. It was a hard ride and the wind didn’t help but we were within the actual time that we needed which is a good sign. The day that everyone was looking forward to or dreading had finally arrived, our trip to Abergavenny and to ride The Tumble. We all met at Cardiff Central Railway Station and caught the 09:20 train to Abergavenny, we just about got all the bikes in the carriage even though it was a tight squeeze. There were 5 of us out on the ride Andy, Gareth, Lara and myself plus a guest rider Keith Sexton. The talk on the train journey was about riding the Tumble and how we were going to tackle it. We were all feeling a little apprehensive about it but were looking forward to it at the same time. We arrived at Abergavenny on time and after a little warm up we set off. It was about a 3 mile ride to the start of the climb and we took the ride at a easy pace getting ourselves mentally prepared for what lay ahead. 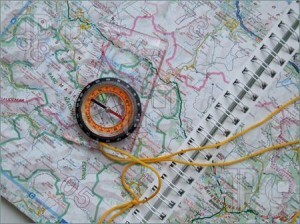 We eventually came to the turning for the Tumble and the climb began. The climb up the Tumble is approx. 6km long and has an average gradient of 10% and each of us have put in words what we were thinking as we rode the climb. In order to cycle up the tumble I thought about anything and everything that wasn’t cycling up the tumble. I planned every outfit for this week, I planned the card I am going to make my mother for Mothering Sunday, I planned her present, I planned the work I needed to do this week, and I also pretended I was walking up the mountain, not cycling. I also wanted to be able to tell everyone I did it in one go, and that spurred me on to not stop. I also thought if I stopped, I wouldn’t start again. Glad to say my strategies worked and I got up there in one go. As we started ascent I was thinking is this as steep as it gets and at one point asked Gareth the same question. I knew that it had taken Gareth about 30 minutes a couple of weeks before so had decided that I was going to have to cycle hard for 30 minutes and just put my head down and looked at my cycle computer. I actually found it easier than I thought and was surprised when I got to the top, where Janet was waiting for us. As this was our first ride up the Tumble Janet Cormack had kindly suggested that she would meet us at the top with refreshments and as we rode to the top she was there as promised with coffee, food and water. Janet has also kindly wrote a few words of what she saw of us as we approached. Saturday 7th March was glorious and sunny. Just the day for sitting on top of the Blorenge waiting to see who passes by. Of course our intrepid cyclists didn’t choose a good day for their practice run up the notorious Tumble, the ‘high point’ of the ride. They went for the Sunday (rain and low cloud) so with slippy roads and low visibility, I ventured forth equipped with nothing more than a six pack (of bottled water! ), three flasks and lots of chocolate / energy bars. Now I’m not cruel, so I decided it could be a tad dispiriting to have someone waving enthusiastically as they went passed in a motor car while you were on that steep hairpin bend. So as the train bringing our five heroic staff pedallers was drawing into town, I was taking the easy way up The Tumble. My arrival at the top was greeted by the usual enthusiastic flock of sheep but the rain quickly persuaded them to head towards slightly more sheltered areas so that removed one of the customary challenges of the upper reaches of the Tumble. This only left the steepish pull up through the woods and the cattle grid to be overcome before we would know which was mightier: CUSP or the mountain. Well, I don’t know if I should have included a drug testing kit within the car as the first rider appeared with a huge grin on his face and no evidence of undue exertion (thus undoing all of the dramatic impact of Gareth’s previous blog). I won’t say the next four looked quite as relaxed as they arrived but they had all conquered The Tumble sufficiently quickly, no-one got hypothermia waiting for the group to reform. 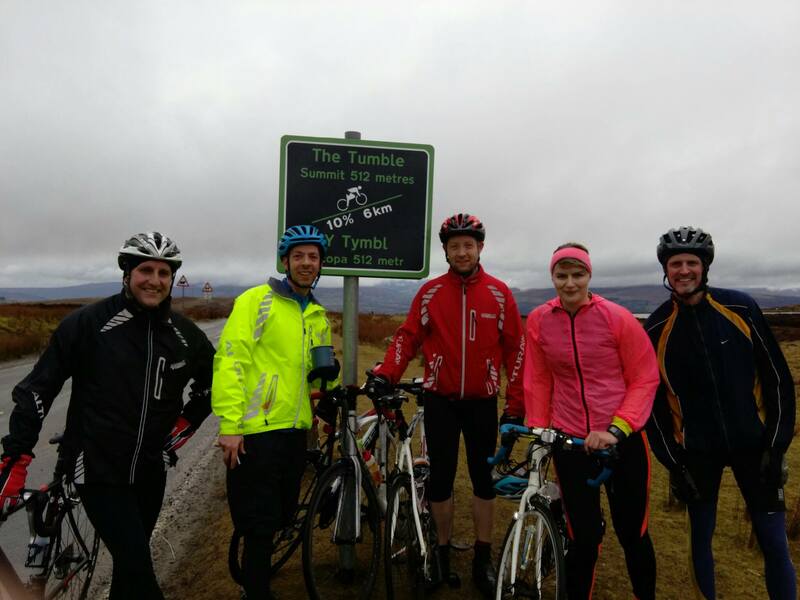 After the coffee break, a team photo opportunity under the Tumble sign. The cyclists headed back down south and I headed north to the Queen’s Head in Cwmyoy (more pub recommendations available for anyone wanting to spend a bit more quality time in Abergavenny than CUSP has managed so far). I understand that The Tumble may have worked its magic on a couple of our riders who are contemplating a return visit to improve on their time up it. At least they all know what is involved now, so those nightmares can be banished as you just have to remember it does gets less steep above the tree line! I’m not sure whether I really was the best that Mike could summon up in terms of cheerleaders, but as I decided the precipitation would play havoc with pom poms, there is still a vacancy for some full-on cheerleading as the training schedule gears up! Unfortunately I got carried away on the downhill and missed the turning and had to make my way back to where Gareth was waiting. The rest of the group had carried on at this point as it was still raining. Gareth and myself never saw the others again but a good ride was had by all and the main aim of the day was to ride the Tumble. A big thanks must go to Janet for meeting us at the top of the Tumble on such a miserable day, it was really appreciated by us all.